An old hymn that so many, both Churches & unChurched know but how wonderful to know more because of the old rugged cross. Music video by Geoff Moore And The Distance performing “The Vow”. i’ ve made commitments before, i’ve made pledges, i’ve signed vows and agreements and i’ve broken them all. One thing i have renewed and God has taken much further than I ever could & that is my vow to love & serve Him. For now we see through a glass dimly but some day we will see clearly. As hard as it is to understand God’s Sovereignty we know by faith He is in control, He has complete control of everything. We can trust Him fully that what may seem unfair or even cruel to us is part of His divine plans. Remember, no matter what you have gone thru or are going thru or will go thru God’s got a plan & purpose. If you haven’t already invite Him in, deeper. He that is in you is greater than this world! We are more than conquerors in Him. He works all things out for the good for those who love Him. God is Worthy to be Praised, anywhere, anytime. God has always done some AMAZING THINGS! As we turn our thoughts on Him how can we help but sing, pray, share (directly or indirectly). Here is a lil’ personal note, i suppose imposed that scripture over a pic. i took. 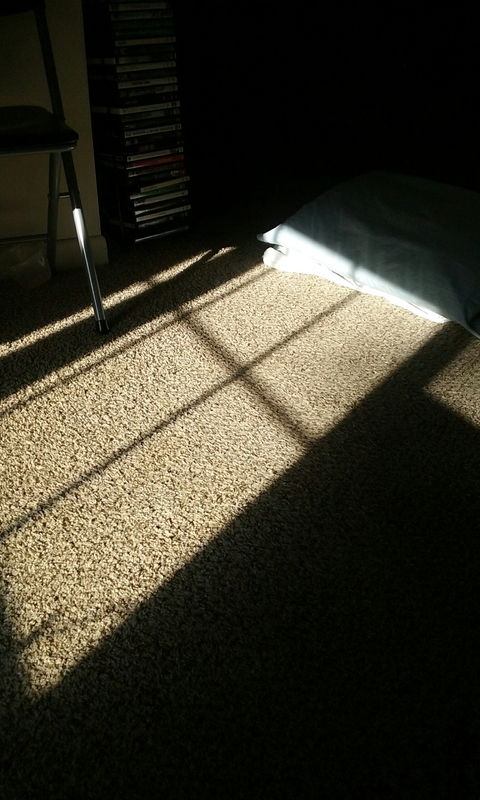 When the sun comes in the Window the shadow of the blinds made the floor, where I laid in back pain, look like a prison cell. When we pulled the blinds open, all the way, the window pane would cast a shadow of a cross. Remember, where there is a shadow there is a light. A young man comes to a preacher at night after over hearing the noise coming from the tent meeting. “Yes you will.” said the preacher, “that Friend is Jesus. HE wants to not only get you in there…” The preacher said as he pointed up, “He wants to get in there…” He smiled as he pointed to the kids heart. In John Chapter 3 we hear about a man that comes to Jesus at night, after over hearing things about Him & His ministry, lifestyle & messages…as well as some miracles He had done. 🔦”Nico” was an elite member of the Jewish rulers. 🔦He comes by night, not wanting to be seen. 🔦He is confronted with his need of a second birth, in order to get to heaven, inherit eternal life. 🔦 He does not understand how that is possible. 🔦Kingdom entrance (eternal life) requires a physical and spiritual birth. 🔦Jesus is surprised that a “teacher” of Israel does not comprehend this truth. 🔦 Jesus reveals His origin and teaching are from heaven. 🔦Jesus promises eternal life to whoever believes. 🔦Jesus came to rescue not condemn the world. 🔦Jesus reveals why some refuse to believe. God doesn’t care how good you are morally, He doesn’t care how religious you are. He cares about you, your soul and how your relationship with Him is. The moral structure & growth comes after He comes in. I feel like to many time some preachers try to convict & convince people to ‘get saved’ but the reality is men & women can not do it, we must be born of His Spirit. Until that is allow BY EACH AND ANY individual (Whosoever) they will not be forgiven, inherit all the fruit of the Spirit (love. Joy, peace, patience, kindness, faithfulness, goodness, gentleness and self control), and eternal life in the future. You come to Him & He comes on in. He is that Friend, that lover, that will never leave you. It is always good to ask questions if your truly seeking God & to know Him better. It is always great when you can go to a chaplain, a pastor, a preacher or a friend. Even better when that person is all the above and above & beyond all else, he is truly a friend, born again, living in an active relationship with Christ. Hunt down the truth for yourself . Leading, going forward, onward physically & spiritually ‘driven’! Because of my physical condition i am only able to crawl (literally) but STILL moving forward, “onward”! Calling “others” to come on, forward in the frey, onward, in Christ we go! To God the commander & Chief, Christ my Commanding Officer & the ever presence of The Holy Spirit my friendly living drill Sargeant. (See “Kicking Against The Picks” in main menu of my blog click here for index). The Apostle Paul, who was at one point known as “Saul the Christian killer”, prayed & prayed & prayed again (three times or more specifically) that the thorn (difficulties/messenger of satan) would be removed from him in Jesus name & for Christ sake. Rejoice, rejoice & again i say rejoice (Philippians 4:4). but I will not boast about myself, except about my weaknesses. Even if I should choose to boast, I would not be a fool, because I would be speaking the truth. But I refrain, so no one will think more of me than is warranted by what I do or say, or because of these surpassingly great revelations. I rejoiced greatly in the Lord that at last you renewed your concern for me. Indeed, you were concerned, but you had no opportunity to show it. But by God’s grace I am what I am, and the grace that he gave me was not without effect. On the contrary, I have worked harder than any of the other apostles, although it was not really my own doing, but God’s grace working with me. So then, whether it came from me or from them, this is what we all preach, and this is what you believe. Now, since our message is that Christ has been raised from death, how can some of you say that the dead will not be raised to life? If that is true, it means that Christ was not raised; and if Christ has not been raised from death, then we have nothing to preach and you have nothing to believe. More than that, we are shown to be lying about God, because we said that he raised Christ from death — but if it is true that the dead are not raised to life, then he did not raise Christ. For if the dead are not raised, neither has Christ been raised. And if Christ has not been raised, then your faith is a delusion and you are still lost in your sins. It would also mean that the believers in Christ who have died are lost. But the truth is that Christ has been raised from death, as the guarantee that those who sleep in death will also be raised. For just as death came by means of a man, in the same way the rising from death comes by means of a man. For just as all people die because of their union with Adam, in the same way all will be raised to life because of their union with Christ. But each one will be raised in the right order: Christ, first of all; then, at the time of his coming, those who belong to him. For Christ must rule until God defeats all enemies and puts them under his feet. The last enemy to be defeated will be death. Someone will ask, “How can the dead be raised to life? not the full-bodied plant that will later grow up. 🌙the moon another beauty, and 🌟the stars a different beauty; and even among stars there are different kinds of beauty. This is how it will be when the dead are raised to life. When the body is buried, it is mortal; when raised, it will be immortal. When buried, it is ugly and weak; when raised, it will be beautiful and strong. When buried, it is a physical body; when raised, it will be a spiritual body. There is, of course, a physical body, so there has to be a spiritual body. For the scripture says, “The first man, Adam, was created a living being”; but the last Adam is the life-giving Spirit. It is not the spiritual that comes first, but the physical, and then the spiritual. The first Adam, made of earth, came from the earth; the second Adam came from heaven. Those who belong to the earth are like the one who was made of earth; those who are of heaven are like the one who came from heaven. Just as we wear the likeness of the man made of earth, so we will wear the likeness of the Man from heaven. What I mean, brothers and sisters, is that what is made of flesh and blood cannot share in God’s Kingdom, and what is mortal cannot possess immortality. Listen to this secret truth: we shall not all die, but when the last trumpet sounds, we shall all be changed in an instant, as quickly as the blinking of an eye. For when the trumpet sounds, the dead will be raised, never to die again, and we shall all be changed. For what is mortal must be changed into what is immortal; what will die must be changed into what cannot die. Death gets its power to hurt from sin, and sin gets its power from the Law. So then, my dear brothers and sisters, stand firm and steady. Keep busy always in your work for the Lord, since you know that nothing you do in the Lord’s service is ever useless. Enjoy the time you have with each other. Here is some imagery. . .
My joy is in Him, not based on how well things are going, what the weather is like or how I ‘feel’. All Glory, Honor & Praise to God The Father, God The Son and God The Spirit whom by His love, grace & mercy gives me reason & purpose to rejoice. Sanctified, meaning to be set aside, is most often used in reference to a being that has been set apart from this world due to ones dedication to a life ever after. You begin to smell the rotting meat you walk in weighing you down, smelling in resemblance to the stench of hospital stink. Temptation sweats from your brow making its way down the side of your pale face while the habits you have left behind linger in your nostril, only a figment. There is a difference between missing something and considering it, this is the fine line that defines a relapse or the lack there of, while simultaneously preventing insanity from creeping its way back into your life. Faith can be described as long suffering and rightfully so as the confusion of disorder has your brain tearing like a muscle, no pain no gain I suppose. again I am not perfect and it shows in my doubt, this is the suffering; the faith.